A city of Holland, situated on the Rhine about fifty miles southeast of Amsterdam. No Jews are mentioned in the records of the city prior to 1404. In that year two Jews are mentioned as having passed through Arnhem on a royal errand to Zutphen, and as having been detained on their return by floods in the former place, where the city authorities provided for their maintenance. A curious statement of the supplies granted them is found in Van Hasselt, "Geldersche Oudheden," i. 66, § 21. The city archives also reveal the facts that about the middleof the fifteenth century a Jew was appointed city physician, and in 1449 a riot took place in Arnhem before the house of a Jew, in which the Jew Isaac was so energetically defended that the authorities, fearing removal from office, agreed to resign in a body if any one of them were dismissed. On Ash Wednesday, 1450, a Jew was baptized in Arnhem, and in 1460 it was announced that all meat sold by Jews must be provided with a little yellow marker; disobedience entailed a fine of ten groschen ("Alle vleesch dat de Joeden gehandelt hebben, en sal men nyet verkoopen, daer en sy een gheel Vaenken by den vleesch daer men 't mercliken bi kennen mach. Die anders dede verloer 10 gr."). On September 21, 1451, Cardinal Nicolaus de Cusa preached in Arnhem on absolution, and declared that none should ever receive absolution who permitted a Jew practising usury to dwell alongside of or below him. At the same time he ordered, under penalty of expulsion, that all Jews should register at the burgomaster's office, and in future wear a Jew-badge upon their outer garment. They were not allowed to exact interest on pledges, nor henceforth to lend money to Christians at all; every transgression of this regulation was punishable with a fine of 4 g. to be paid by both Jew and Christian. Within the space of a year all existing loan-offices must be closed without stringency upon borrowers; and Jews must leave the city, unless they earn their bread by labor and honest commerce without usury, and wear a badge for recognition by all ("Oir broet met hoeren Arbeide verdienen of regtveerdige koomanschap sonder woekeren, doen wolden, en mits zy dat Teyken boven heur Cleeden dragen, daer men se bi kennen mach"). Meanwhile it was ordered that no one should do them any injury by day or night, openly or secretly ("dat nyemant an den Joeden enich arch sou keeren by dage off by nacht, heymelich off openbaer"). On Jan. 10, 1571, Alba notified the authorities of Arnhem that all Jews living there, and all their property—of which an inventory was to be made—should be seized and held in ward until further disposition be made. This demand was, as far as is known, not complied with by the authorities of Arnhem, while the authorities of Zutphen replied that no Jews lived there. Probably as a result of Charles V.'s cruelty the Jews left Holland; they returned, however, in the seventeenth century, when Jews were found in the eastern portion of Gelderland and Holland. Immigrants from Poland also arrived, usually by sea, and settled preferably in the western harbortowns. Not until the end of the seventeenth century were traces of Jews again found in Arnhem. A resolution dated March 20, 1663, denied citizenship to Jews, and forbade them to follow the butcher's trade; it shows that they had at least the right to settle there. The first mention of a synagogue was made in 1735, when the physician Levi Heymans registered a complaint with the burgomaster and the assessors, in which he petitioned that the congregation "be compelled to afford him peaceable possession of his sitting in the Jewish synagogue." On Feb. 7, 1765, three Jews, as wardens of the Jewish congregation, presented a petition stating that the congregation had greatly increased in numbers, and that their meeting-place for prayer in the house of Solomon Cohen, which they had used a number of years, had become too small. In response they were requested to prepare a plan and submit a constitution and by-laws for the government of an incorporated congregation. The plan submitted was officially approved April 17, 1765, the congregation was established, wardens were elected, and the constitution was read at a meeting of the congregation. Among the first wardens was Samuel Jacob Hanau, who was associated with a Catholic named Kerkhoff in a large china and pottery factory, the products of which were used by the city authorities and were famous for taste and finish. In the Walstraat, close to the town wall, a house was set aside for the synagogue; the approach to it was by a narrow lane which still bears the name "Joedengang" (Jews' way). It was leased for twelve years, from April 1, 1769; and in 1782 another house close to the wall, by the Velperpoort, was hired and fitted up as the synagogue. At first the Jews of Arnhem buried their dead in the neighboring village of Huizen. Later they used the more distant cemetery in Wageningen, where a considerable Jewish congregation existed. Two Jews, Solomon Cohen Jacobs and Samuel Levie, on Sept. 22, 1755, petitioned the authorities for a suitable burial-place. By a resolution of Oct. 13, 1755, a lot forty feet by one hundred was assigned to them, to be fenced in by them, but otherwise free of all expense. On April 11, 1808, a larger tract was purchased (adjoining this), and continued in use till 1865, when a general city cemetery was laid out, and a distinct portion was assigned to the Jews. An agreement was made that the Jews should not alienate their part of the cemetery, and that the city should never disinter the bodies. A benevolent society was established, possibly only a burial society, although, according to a provision of the by-laws, all fines collected were to be paid partly to the town hospital, partly to the Jewish poor. When the congregation became too large for this synagogue, a site for a new building was purchased in the Kerkstraat for 5,000 florins in 1798. It is evident that at the end of the eighteenth century the congregation of Arnhem was prosperous, and that it contained many wealthy Jews. This fact is shown by an event mentioned in only one place (Van der Aa, "Aardrykskundig Woordenboek," under "Arnhem"). In 1783 a riot took place in Arnhem because the city authorities sold a portion of the old burial-place surrounding the large church on the "Marktplein" to a Jew, who erected thereon a mansion. Public indignation was allayed only by the restoration of the cemetery, properly fenced in, to its original purpose. In 1852 another site was purchased, upon which the present synagogue stands, the former building being used for a school. On Aug. 19, 1853, a new synagogue was consecrated. A model bath-house was established in 1885 through the efforts of Chief Rabbi T. Tal. In 1891 the school was removed to an elegantly appointed building belonging to the congregation, adjacent to the syna gogue. After the time of the French consistorial division of the country, Nymegen was the seat of the rabbinate for the province of Gelderland. 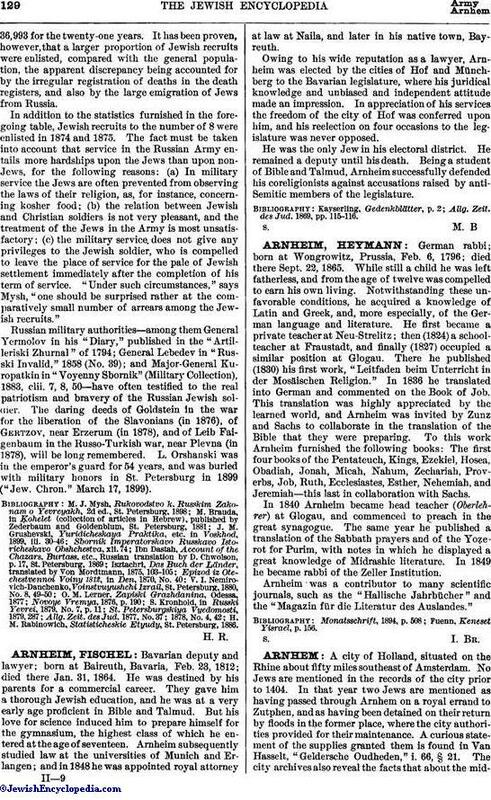 But on the death of Jacob Lehmans, in 1881, the seat was transferred to Arnhem; and on June 26 of the same year Tobias Tal, a graduate of the Amsterdam rabbinical seminary, was elected chief rabbi. He remained until he was called to The Hague in 1895; and his brother-in-law, Louis Wagenaar, formerly chief rabbi in Leeuwarden and of the province of Friesland, was appointed his successor in Arnhem. Other learned men, with at least local reputation, were: Joel Frankfort, teacher from 1836 to 1866, esteemed for Talmudic learning; J. Waterman, translator of Fürst's Hebrew lexicon into Dutch, and a leader of the reform movement in Dutch Judaism which reached fullest development about 1860. In 1780, the jurist Jonas Daniel Meyer was born in a house situated where the synagogue now stands. The Dutch poetess, Estella Herzfeld, wife of Mr. Hymans, passed a portion of her life in Arnhem. 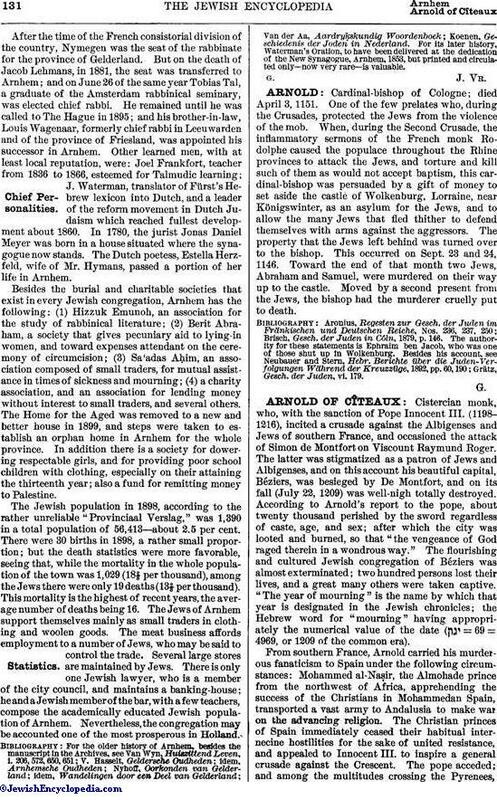 Besides the burial and charitable societies that exist in every Jewish congregation, Arnhem has the following: (1) Hizzuk Emunoh, an association for the study of rabbinical literature; (2) Berit Abraham, a society that gives pecuniary aid to lying-in women, and toward expenses attendant on the ceremony of circumcision; (3) Sa'adas AḦim, an association composed of small traders, for mutual assistance in times of sickness and mourning; (4) a charity association, and an association for lending money without interest to small traders, and several others. The Home for the Aged was removed to a new and better house in 1899, and steps were taken to establish an orphan home in Arnhem for the whole province. In addition there is a society for dowering respectable girls, and for providing poor school children with clothing, especially on their attaining the thirteenth year; also a fund for remitting money to Palestine. The Jewish population in 1898, according to the rather unreliable "Provinciaal Verslag," was 1,390 in a total population of 56,413—about 2.5 per cent. There were 30 births in 1898, a rather small proportion; but the death statistics were more favorable, seeing that, while the mortality in the whole population of the town was 1,029 (18⅔ per thousand), among the Jews there were only 19 deaths (13⅔ per thousand). This mortality is the highest of recent years, the average number of deaths being 16. The Jews of Arnhem support themselves mainly as small traders in clothing and woolen goods. The meat business affords employment to a number of Jews, who may be said to control the trade. Several large stores are maintained by Jews. There is only one Jewish lawyer, who is a member of the city council, and maintains a banking-house; he and a Jewish member of the bar, with a few teachers, compose the academically educated Jewish population of Arnhem. Nevertheless, the congregation may be accounted one of the most prosperous in Holland. Koenen, Geschiedenis der Joden in Nederland. 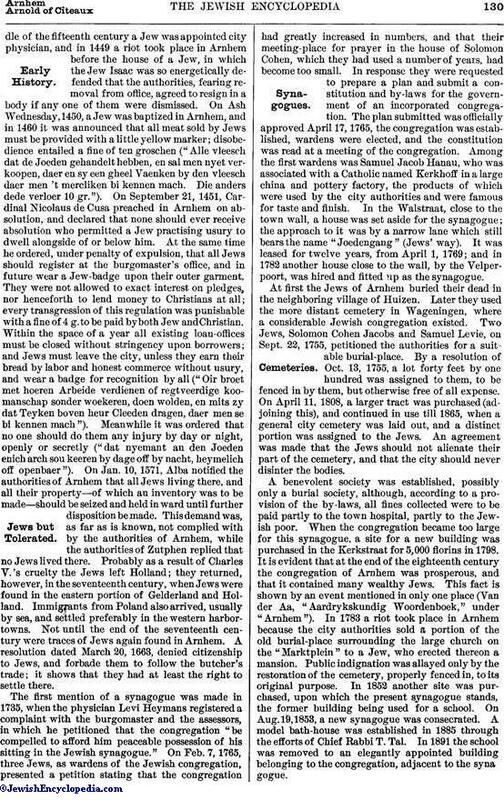 For its later history, Waterman's Oration, to have been delivered at the dedication of the New Synagogue, Arnhem, 1853, but printed and circulated only—now very rare—is valuable.